It is no secret that Google wants us to use its search engine more and more. That’s how they make money. Now, imagine YouTube. You open YouTube to watch one video, and end up spending two hours. This is because Google has an amazing algorithm that surfaces related videos that you are likely to watch. Looks like they want to try something (remotely) similar to this on Chrome too. 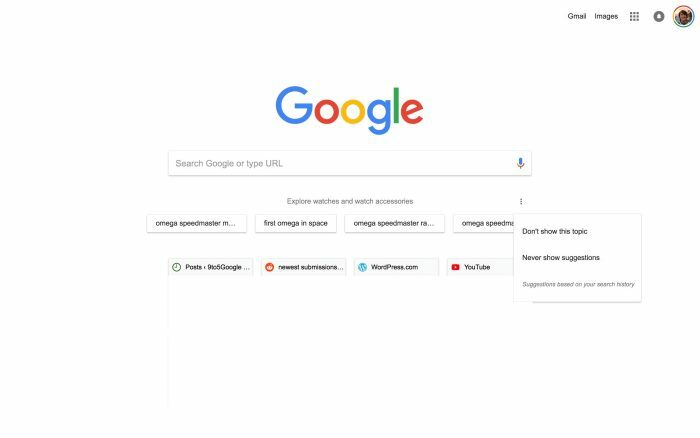 9to5Gogle has spotted a new feature that the Chrome team is testing. There is no flag that you can enable to get this feature. However, if you get lucky, you will see suggested keywords on the new tab page, below the search box. You can click these suggestions to start a new search. n overflow button to the right gives users the option for “Don’t show this topic” and “Never show suggestions. I do not know how I will respond to these suggested queries. I definitely am impressed with video suggestions on YouTube. However, here, there is no visual element. What do you think? Will you be interested in keyword suggestions based on your search history ? And what about the privacy aspect? But we do all those private searches on Incognito Mode right!